I started making green eggs when my daughter was a Dr. Seuss-loving toddler. I started out serving it as a sandwich spread, but now that my family is on a gluten-free diet, I serve it with salad. Let’s start with the recipe. Boil eggs. For perfect yellow yolks, put eggs in a saucepan and cover with water. Bring to a rolling boil on high then turn the burner off. Let eggs sit in hot water for 15 minutes. Pour out the hot water and replace with cold water. Let it sit for a few minutes, until eggs are cool enough to touch. Peel. 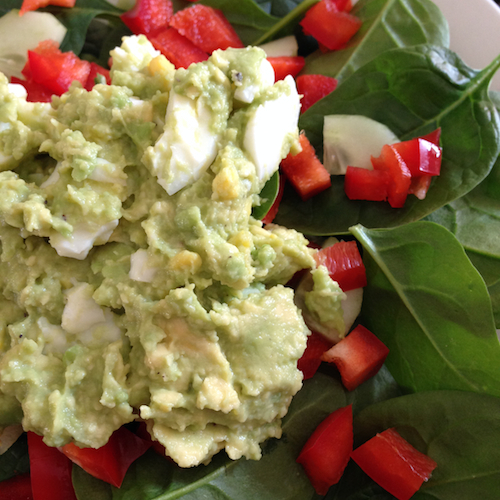 Mash the avocado, then add eggs cut up roughly with a spoon. Mix together. Salt and pepper to taste. 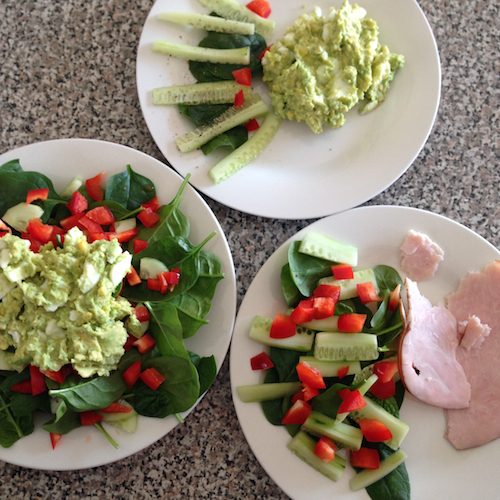 Mine, left, on a heap of green salad – spinach, cucumber, red pepper. My daughter’s, top, on the side of 9 spinach leaves (for every year of her age), cucumber slices, and 5 tiny bits of red pepper. My husband’s, right, no green eggs. Just a salad and slices of deli turkey. He does not like green eggs and ham. He does not like it, Sam-I-am.